Last month I watched the new Cinderella film and as I had predicted I fell absolutely in love with it. I love all things Disney and princess and being a writer has meant that I have gotten to carry on living in my own fantasy fairytale world. My favourite thing to write even now as I am working on my novel and my children's book is a fairytale. Sometimes when I need to just take a break I love to just sit pen in hand and fall into a fantasy world of dragons and princess, fairies and goblins all wrapped up in a happy ending. But this got me thinking, I often think how wonderful to live in a world where people are good and honourable and courageous and kind. But I believe that so many people already are like that we just often need a little reminder. I absolute love the slogan from the movie - Have courage and be kind. I think its a great little motivational motto to live by. The world is a tough place and it can be hard and it takes courage and strength to persevere through and what a better way to do so then to be kind to all you meet. We live in a world that is often very unkind and sometimes it even takes courage to be kind to some one. 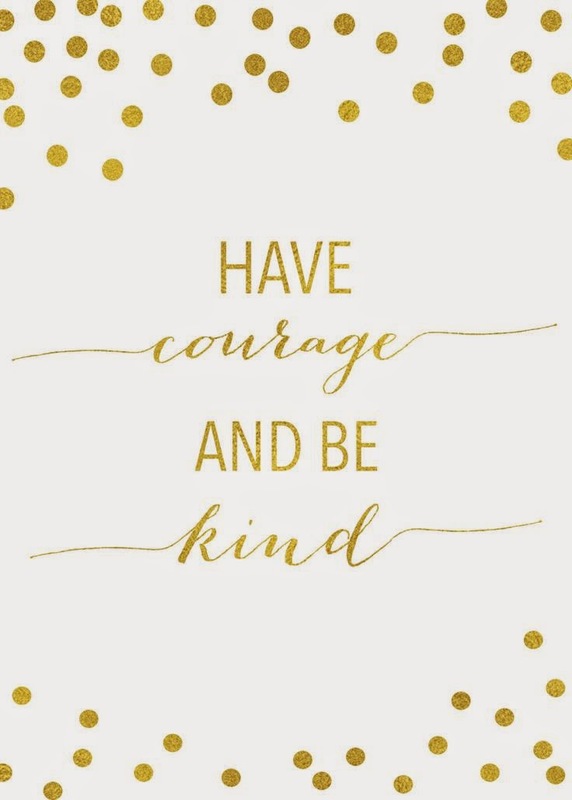 I really want to get a print of this phrase and stick it on my wall at uni as a reminder to keep on being brave and to keep on doing what I love to always have courage and be kind.